If they have had a little experience with literature guides and high school-level writing, Intermediate Guide to High School Literature & Composition: Part B is a great way to continue! This one-semester guide (consider starting your year with Intermediate Guide to High School Literature & Composition: Part A – but you don’t HAVE to use the guides in order) will extend your high schooler’s language arts skills. This 45-page downloadable pdf workbook by Vicki Tillman, is easy to use so a student could follow the process even if he or she does not have a teacher who is experienced in writing poetry.The guide is written to be used over a six-week period. This e-text is written in a friendly manner, conversational in tone, and can be used independently or with a co-op. Poetry is intimidating to many students and to some homeschooling parents as well, but poetic language and expression become accessible and fun with Vicki’s poetry writing curriculum guides. Explore poetry and give your homeschooling teen an opportunity for fun and growth in word power! Many homeschoolers will find that when they start college, their science and social science courses require writing in APA-style. It is a VERY different format from the fun and familiar MLA-style research paper. It can be overwhelming! 7 Sisters Introductory Guide to APA Research Paper Writing, a downloadable .pdf text, can help by guiding your homeschooler through a step-by-step process of learning how to handle the format and think like an APA-writer! Poetry can be a challenge when it should be a delight. Written to accompany British poet T.S. Eliot’s imaginative 1939 collection of poems, this 14-page literature study guide by Sabrina Justison helps you get the most out of Old Possum’s Book of Practical Cats. Written to accompany British author Malcolm Muggeridge’s 1971 account of Mother Teresa’s contagious compassion, this 9-page literature study guide by Sabrina Justison helps you get the most out of Something Beautiful for God, focusing on interpretational reading and helping students articulate a personal response to the text. Written to accompany Greek playwright Sophocles’ 441 BC epic tragedy, this 9-page literature study guide , written by Sabrina Justison, will enhance your child’s understanding of Antigone focusing on the literary devices of character structure and motivation. Written to accompany British author H.G. Wells’ famous 1897 science fiction novel, this 11-page literature study guide by Sabrina Justison and Dr. Gerald R. Culley helps you get the most out of The Invisible Man, focusing on two themes: the individual in the midst of the mob, and science and society. Written to accompany American author Louisa May Alcott’s beloved 1868 story of the March family, but focusing on the ideas of American Transcendentalism that are woven through every chapter, this 8-page literature study guide by Sabrina Justison helps even male readers or those hostile to the idea of tea parties get the most out of Little Women, and brings an even deeper appreciation to those students who naturally love the book at first reading, looking at the story through the lens of American Transcendentalism. Lead your homeschooling high schooler to the Shire, where “in a hole in the ground there lived a Hobbit”. Your student will watch as good and evil are exposed and evil is conquered. Written to accompany British author J.R.R. Tolkein’s 1937 multi-genre novel, this 13-page literature study guide by Vicki Tillman helps you get the most out of The Hobbit. 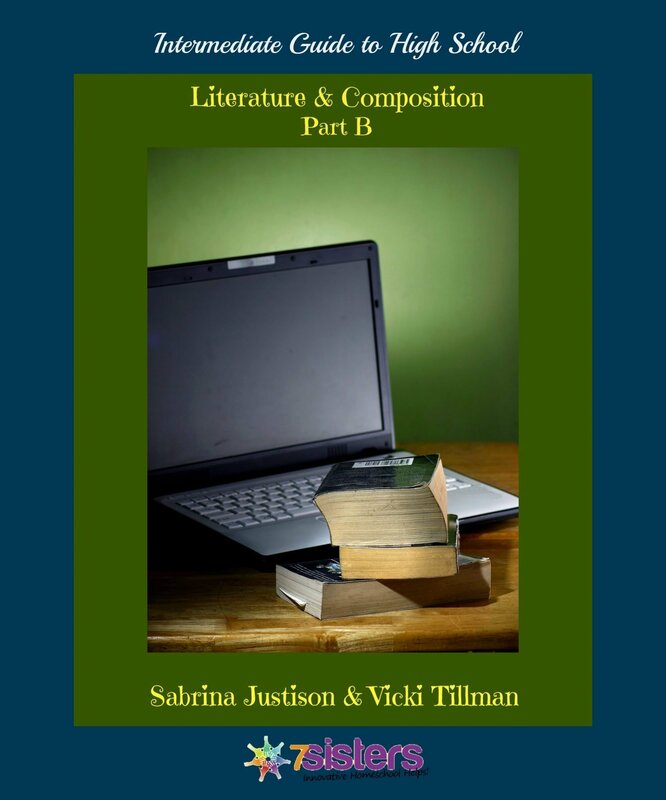 Download your copy of Intermediate Guide to High School Literature & Composition Part B today and bless your homeschool high schooler with some TERRIFIC Language Arts learning!